Keith Haring was influenced heavily by LA2′s graffiti and many of LA2′s works are mistaken for Keith Harings.Within the past 2 years a collaboration Haring/LA2 of an Egyptian mummy sculpture traded at auction for $80,000. 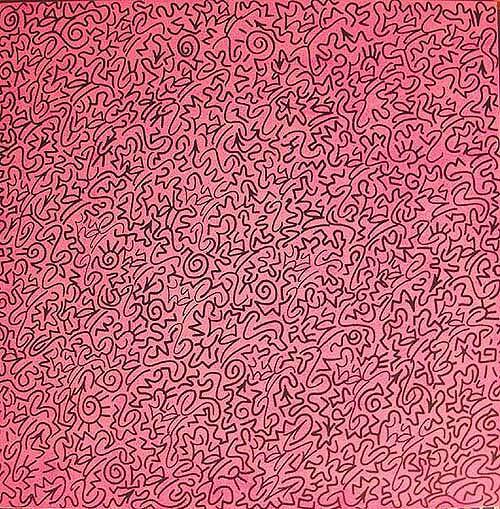 LA2 was discovered by Keith Haring in the early 1980′s and became his close friend and collaborator, traveling the world together, painting murals and sculptures. Signed and dated on the back by artist. You may also see three of his paintings exhibited at Pepperdine University in the Frederick Weisman Collection, or the Weisman Museum in Bel Air . LA II has shown his work in every major museum in the United States and gallery’s throughout the world including the Whitney Museum in New York City. LA II and Keith Haring recently had an exhibition at Jeffrey Deitch in New York City ; the exhibition is now traveling internationally.